For musicians, few experiences resonate deeper then the thrill and energy of performing for a live crowd. And young musicians around Milwaukee have long drooled with desire to get a coveted Summerfest gig. 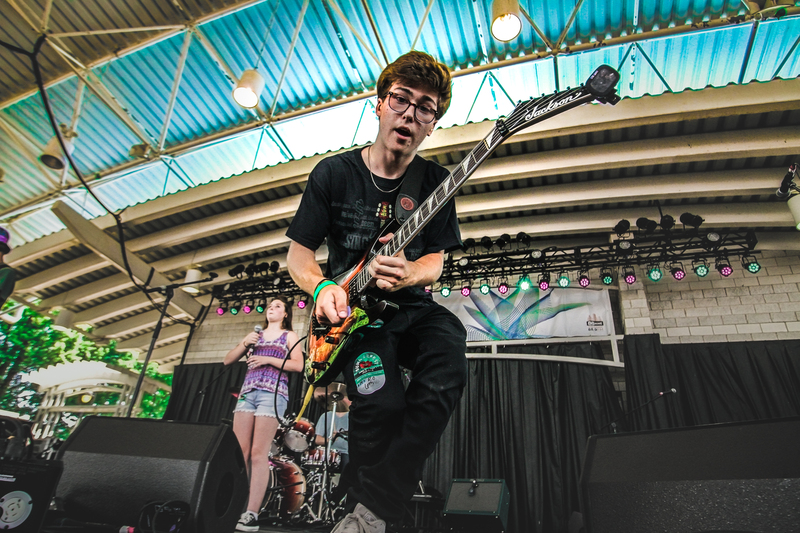 Lucky for the youth of Wisconsin, the dream of “some day” performing onstage at Summerfest can be achieved by the “Rockonsin” state finals held on the Johnson Controls stage. The top 12 bands perform for a Summerfest crowd and a panel of judges with the winners and runners up receiving their own full set on the US Cellular stage. A pretty nice package if I do say so myself. Brave and talented souls required to include a video of the band performing as submission. Lord knows these young musicians were going to make the most of every minute of it! This years lineup consisted of Fightin’ Bob, Sixth Street, Screaming in the Cul-De-Sac, Orange Afternoon, Negative Positive and Figure it out preforming on June 29. While on June 30th ,Quick and Painless, Through the Kitchen Hole, Koru, Simple Gesture, Brady K Project and the Dropouts rocked the stage. Each group played a 15 minute set. Some of the bands throughout the competition took the opportunity to showcase their own original compositions. Others chose to play half covers and half originals. Regardless, any opportunity to work up an audience is crucial. Whether it is one of your own songs or a raucous version of “CrazyTrain”, these kids were truly in their element. “Im not working no 9-5. It’s a guitarist or I’ll be professionally homeless” says Benson Wood the guitarist for Quick and Painless. I got the distinct feeling he wasn’t joking. I also wasn’t surprised to hear just how many of these kids were working toward a dream of becoming professional musicians. For example, bands like Screaming in the Cul De Sac who formed less then two years ago already frequently play live shows as much as possible. They even snagged themselves a spot playing a set for Summerfest on June 30th while the second day of “Rockonsin” was commencing. This same passion is seen in the group of brothers from the band Brady K project. Brady, A.j. and Cam Ketarkus all have been playing from a young age. In fact, it was front man Brady who first wanted to drum as a child but after his brother picked up drums with such ease, he decided to focus on his piano, ukulele, and writing skills. Each member’s work clearly payed off as seen in their performance of their live original songs. I would find myself often connecting with the musical style of their songs as well their message of peace and connection. I spoke to most of the artists who performed at this years Rockonsin and every one of them were incredibly talented beyond their years. They all had genuine interests in music and arts and spoke of the artists who inspired them ranging from Soundgarden to Avenged Sevenfold to the Beatles. All the bands were genuine in their appreciation of their influences yet never wore that appreciation on their sleeve. Dennis Graham runs Rockonsin is a non-profit organization and has showcased young musicians in this garage band styled program for 14 years. I spent a fair amount of time with him over those three days, and I have seen his commitment to these young artists. I can only imagine this competition runs very near and dear to his heart. Rockonsin is supported by many businesses and media in Wisconsin including Maximum Ink music magazine since the beginning. The whole process runs annually and begins again as soon as the winners exit the stage. In 2018 it was no different. Bands were encouraged to submit a live performance of a song original or cover by April 30th, 2019 in hopes to be one of the 12 selected for next years lineup. Or better yet, the winner of their own Summerfest show. So who took home the 2018 Rockonsin crown? On July 1st Quick and Painless took the stage following runners up Through the Kitchen Hole . Each performed a well deserved 45 minute set worthy of the packed crowds enthusiasm. First place winners Quick and Painless preformed a solid classic rock set featuring covers like Jimi Hendrix’s Purple Haze and Steve Miller’s The Joker. Frontman Everett was visibly engulfed in his music appearing to savor the moment. Everett moved around the stage leaning back while ripping into his PRS guitar. He was putting on a great show and understandably so, this would be the first time actually preforming in the Rockonsin competition after having submitted 3 years in a row to no avail. Hey it is a tough business.